The Puffin colonies on Ailsa Craig and on the island of Sanda, at the Mull of Kintyre, are increasing. From the records held by the Arran Natural History Society there are signs that the number of sightings in Arran waters has also increased in recent years. 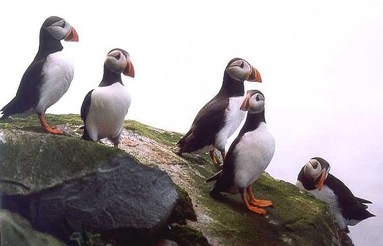 From 1990 to 1999 there were, in those ten years, only twenty two records of Puffin sightings. At the start of this century from 2002 to 2004 there were only two records. More recently there are signs that the sightings are increasing. In 2005 there were three records, in 2006 four records, in 2007 five records and already in 2008 there have been five records, one of sixteen birds. There is no doubt in my mind that a major factor contributing to this was the outstanding work of Dr Bernard Zonfrillo and his team in eradicating rats from Ailsa Craig. In 1871, the Puffin colony on Ailsa Craig was described as in "bewildering numbers... so great that they darkened the sky" . But by 1934 they were "practically extinct". What happened in between was that rats from ships had been introduced. The first rat was recorded in 1889, and a year later the light-keepers killed over 900 rats. "They are all over the island, from the very top down to the water's edge". Puffins nest in burrows and once the egg is hatched both adults go regularly to sea for fish for the young chick. This makes the young particularly vulnerable to rats. Attempts to eradicate the Ailsa Craig rats were carried out in the 1920's, but they failed due to the poisons used being ineffective. Ailsa Craig was infested by rats until 1990 when Dr Zonfrillo and his team got involved. On 15 April 1991 the last live rat was seen on Ailsa Craig. To find out how this was done, with the aid of over five tons of lethal Warfarin rodenticide, a Sea King helicopter, a lot of hard work and a systematic monitoring program over years, I recommend this article by Dr Zonfrillo “Before and After the Eradication of Rats” on the Ayrshire Birding Website. As regards the Puffin, which had formerly bred in vast numbers on Ailsa, one was seen ashore entering a suitable cliff crevice in 1991. In 1992, none was ashore, but at sea numbers of prospecting birds in regular groups of 5 or 6 were evident just offshore. Over the next ten years the numbers built up and in 2002 Dr Zonfrillo said: "Twenty birds were seen on the island over the summer, of which four paired up and were seen carrying fish, a sure sign that they are breeding.” Finding individual nests among the fallen rocks and broken granite is virtually impossible. After more that ten years of monitoring work, it was success at last. Non-breeding Puffins always outnumber breeding pairs but the increase continues. This year (2008) on occasions there have been over two hundred Puffins around Ailsa Craig, all potential future breeders. The future looks bright for Puffins in the Clyde. Based on the experience of Ailsa Craig, it is interesting to speculate if the rats and mink could be exterminated on Pladda or Holy Island would the Puffins be attracted to these islands as well. Something to think about.